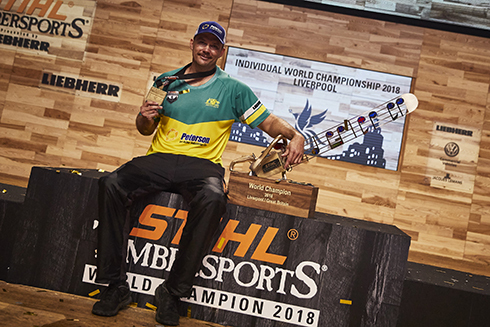 Victorian Laurence O’Toole has been crowned World Champion, winning gold at the 2018 STIHL TIMBERSPORTS® World Championships in Liverpool, England. 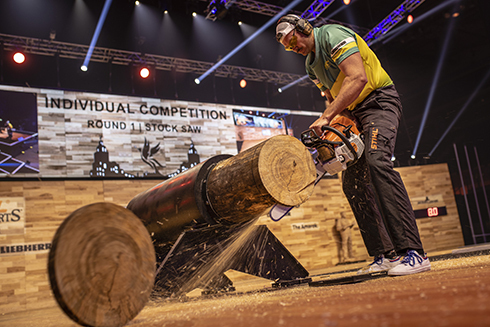 Donning the green and gold guernsey, the 36-year-old from Doncaster powered through six saw, axe and chainsaw disciplines to triumph over fierce competition from 11 competitors across 11 countries, including the US, Canada and the nine-time world champion Jason Wynyard from Australia’s biggest sporting rivals, New Zealand. The winning moment was a sight for ‘saw’ eyes for the Australian fans who travelled to the packed Echo Arena in Liverpool to watch O’Toole win his first ever world championship. Laurence took on the USA’s Matt Cogar in the final round on the hotsaw, cutting a personal best time of 5.79sec to finish on 69 points, and claim the title of World Champion. WIth his father Laurence O’Toole Snr in the audience the moment was one of great emotion for Australia’s most famous wood chopping family. Competing with razor sharp axes and high-powered chainsaws, the night started out well for Laurence, placing 2nd and picking up 11 points from a maximum 12 on offer in round one. 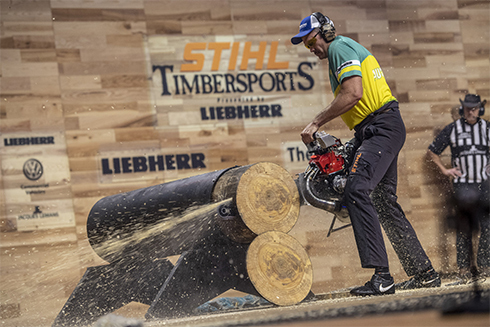 It looked like he’d all but blown his chance in round two with the STIHL Stocksaw, where a mis-alignment on one of his cuts cost him vital seconds and pushed him down the ladder. He recovered well in round three to claim nine points and leave him tied for 4th place, going into the final double points rounds. It was here Laurence showed his expertise taking 1st place in both the Singlebuck saw and the Spring Board to leave him five points clear of Matt Cogar from the US going into the final round with the Hotsaw discipline, worth triple points. O’Toole’s win is the icing on the cake during a weekend dominated by Australia, with the Australian Chopperoos also making history on Saturday morning beating the USA in the team relay finals to set a new world record time and win their fifth STIHL TIMBERSPORTS® World Championship, cementing their title as the most successful national woodchopping team of all time.